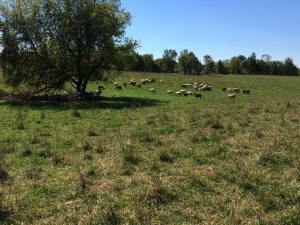 Today I managed to walk the pasture and take some pictures of our ever-expanding flock. 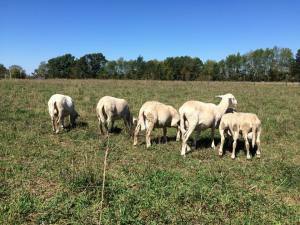 Our commercial flock is up to almost 80 ewes and we purchased 11 registered Katahdin ewes and 11 registered Katahdin lambs this summer. 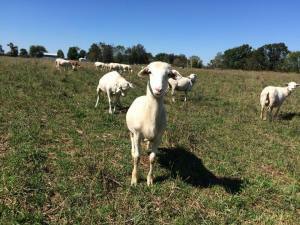 We’ve sold out of freezer lambs this season, sold quite a few ram lambs for breeding, and our sales to the Islamic community increased this year. We’ve decided to hold back all of our ewes as we’ve been able to plant all of our acres to pasture and put up more fence. We’ll likely be lambing early in 2016 or maybe even late this fall, as a few ram lambs got in with the flock due to a fence failure. Hopefully we’ve solved that problem for next year! If not, we’re sure the goats will find the holes… again. 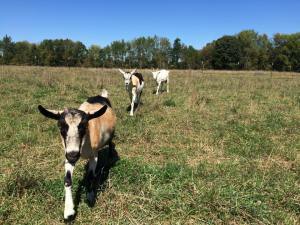 We’ve nicknamed our three female goats the goat patrol because it looks like they are always on the look out for weaknesses in the fence. 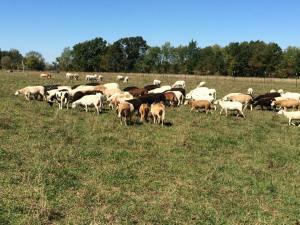 We sold two goats this year, one female and one buck. Hopefully the buck serviced the three remaining ladies so we’ll have plenty of milk for any orphaned lambs. If so, we’ll likely have a few Alpine/Sannen crosses for sale again next year. Four registered ram lambs and one ewe. We’ll be keeping the best out of these four for breeding next year. 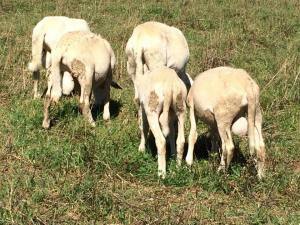 Nice looking five-month old registered ram lambs. Love this boy’s pink nose! Some enjoy shade, some enjoy sun, on this warm and beautiful first day of fall.